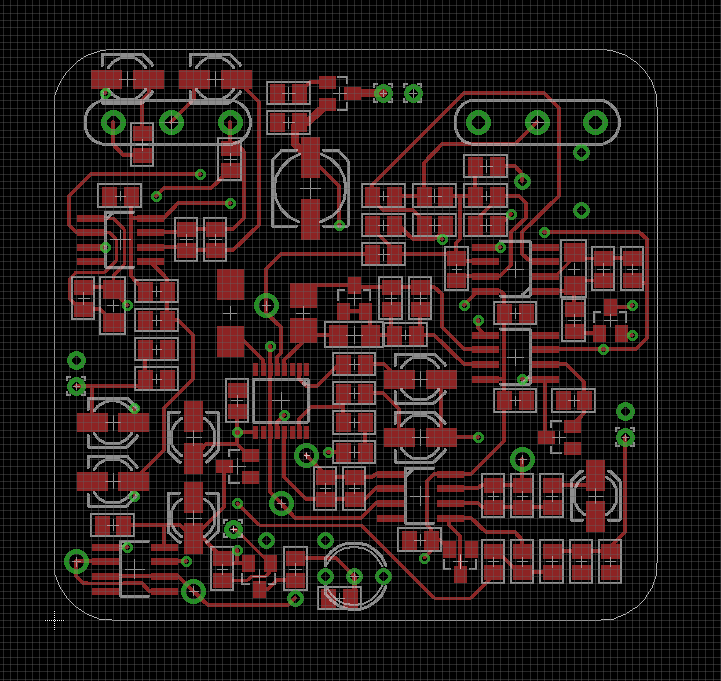 I designed and ordered the pcbs already quite a while ago, but only recently got around to building it. It's a great and neutral sounding compressor! It works really well for me in almost any setting. With clean sounds for non-invasive dynamic reduction as well as distorted sounds for long and standing tones. So thanks! But I have a couple of questions if you don't mind. What was your reasoning behind choosing the 4316 over the 4315? The website states +-60dB gain range for the 4315 vs. +-50dB for the 4316. In the datasheet for the 4315 it says +-50dB though. Do you know which is right? I'm asking because I'm wondering which part to use for a gating circuit. Would you consider 50/60dB "off enough" or would you rather recommend the 4320 with -100dB range? Since noise already should be a fair bit lower in level compared to the signal I would think it should suffice. The datasheet advises to keep the EC pins within 0,5V of VCC/2, 60dB would be 0,36V of control voltage. Could it possibly be driven further for higher attenuation? Rising distortion or non-linear gain law wouldn't be an issue for my application. Beautiful work! Thank you for sharing it, your feedback and the kind words. Send us some sample sound files! We used a 4316 in that circuit to introduce the part. I just checked the 4315 data sheet and it says ± 50 dB. I think the 4315 product page may have an error. In either case, for maximum cutoff, I would use differential Ec control to double the attenuation vs. Ec. That works for the Blackmer® cell in the 4315 and gets you more attenuation so that you can stay within 500 mV of Vcc/2. I've used differential Ec with the 4316 and 218X-series to minimize AC-feed-through in a modulator application and it works very well. I think JR has said somewhere he used differential Ec in a VCA application. The 4316, which is not a Blackmer cell, also benefits from differential Ec in a modulator so it would seem to offer benefit as a gate to keep Ec within 500 mV of Vcc/2. But I don't think it could provide -100 dB. Its worth trying though - you don't need a lot of linearity in Ec in deep attenuation when using it as a gate and 50 dB might be enough in an MI application. BTW in an update to the original circuit I found that a TL072 was much quieter than the MC33178. We used the '33178 for its low power and IIRC sims showed it to be as quiet as a TL072 but its not. For simple applications only varying a couple 10 dB single Ec is effective. For fader automation where you may want to command large amounts of attenuation the differential Ec reduces the voltage difference between control ports and the VCA internals. It has been many years since I looked at this but if you want to realize -100dB, differential Ec seems prudent. Trying to get more than -100dB seems impractical as many glue circuits could have that much crosstalk, or more. I would also avoid operating VCAs off the page of what they recommend in their application notes. PS: while 100dB of kill may look good on a data sheet, it will take more time to open back up to unity gain, a real world consideration for noise gates.. 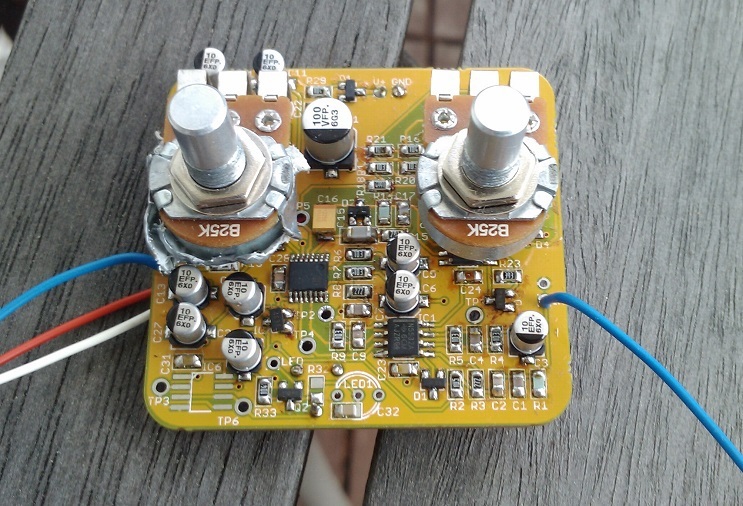 Trying to get more than -100dB seems impractical as many glue circuits could have that much crosstalk, or more. That is indeed quite tough even with a back-grounded relay providing mute. Rosalfonso at THAT suggested that we look at figure 6 in the 4316 datasheet which shows Attenuation vs. differential Ec. The slope is 6.1 mV/db but each Ec port sees half that. Thanks for looking into it Wayne and JR, food for thought. At the moment I'm just contemplating the idea of making a basic signal path for a guitar pedal, combined with a digital sidechain. The THAT analog engines make that a fair bit easier by providing the RMS output, saves rectification and LOG-ing the signal inside the controller. The pedal could then be anything from a noise gate, to tremolo, do swells and fades, combine these two for reverse-playback-style sounds, or a compressor if I'm not fed up with all the coding by then . I can do that once I get a second one built, the first one is already out of the house with a happy friend. The TL072s only in the signal path I assume? Offset (and possibly noise) is probably too high to drive the EC port. For my first build I used NE5532 for handling the signal, 33178 for the sidechain. I never even include battery snaps in my pedals, so current consumption isn't really a concern. You should sell the PC boards! I substituted a TL072 for the signal path only, shown as op amps A and B in the original. The 33178 was ideal for the Ec section. The TL072 may be quieter than a 5532 in the input stage due to a much lower current noise. I've never used a 5532 for a guitar pickup input. They may do fine. I do know the TL072 was quieter than the MC33178 even though the '072's voltage noise is more than double the '33178. The '33178 has a current noise of 0.15 pA√Hz (1 kHz typ. ); the NE5532 is around 0.7pA√Hz. The TL072 is around 0.01 pA√Hz. Yeah, effect inputs are a strange breed. They need to deal with a range from a couple ohms up to possibly 250k. Worst case Les Paul is 125k, but I've seen effect outputs with 1M pots . Choose your poison. I'm not sure there is too much enthusiasm among the audio crowd for SMD. It's weird, in all other branches of electronics it is perfectly fine and accepted and not even questioned. Why would it be, of course people want to use modern parts that perform better, are easier to obtain and often cheaper. Only the audio branch seems to be lagging way behind. 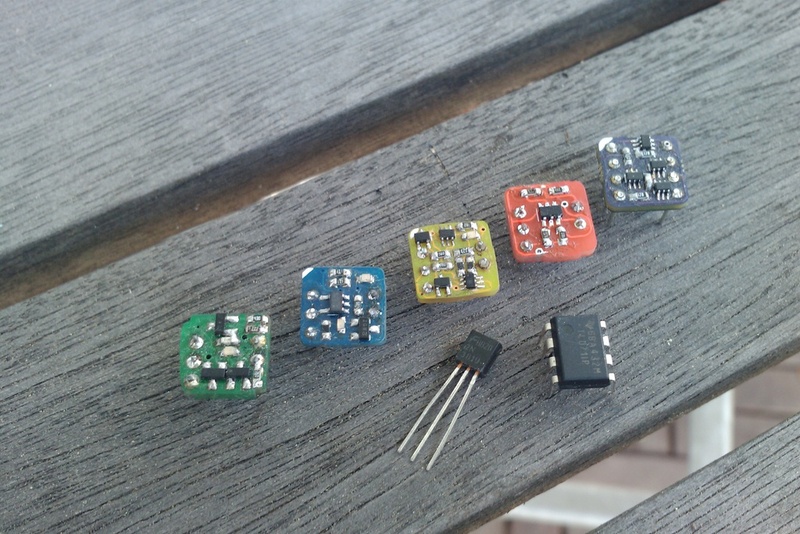 I offered these pcbs* for discrete opamps for free on a guitar effect forum with 100s of active posters and 1000s of lurkers. Exactly one person took me up on it. Or maybe it was just the general lack of interest in torturing oneself with building these when you can just plug a 20ct part, I don't know . All but the purple one are singles, evolution from left to right. The yellow one has actually pretty respectable performance, 10 transistors and 13 passives on a cm² of pcb real estate. Definitely up to par with some integrated parts as far as I can tell from some quick measurements. But they were always intended for effect applications, hence the space restriction, and no intent to really beat out the integrated competition. Last edited by hazmo on Fri Jul 20, 2018 12:41 am, edited 1 time in total. I can definitely understand the lack of enthusiasm for soldering SMT. I did a small through-hole distortion effect using the 4316 mounted on a DIP carrier. What I thought about doing for DIY in "production" was to pre-assemble the 4316 SMT on the PCB with the rest through-hole. I found that people liked it but it needed a gate due to its sustain at high distortion settings being a little too infinite. It would have been simple to add but I haven't gotten around to it. Your op amps look cool but I would want them assembled 'cause I couldn't handle it. 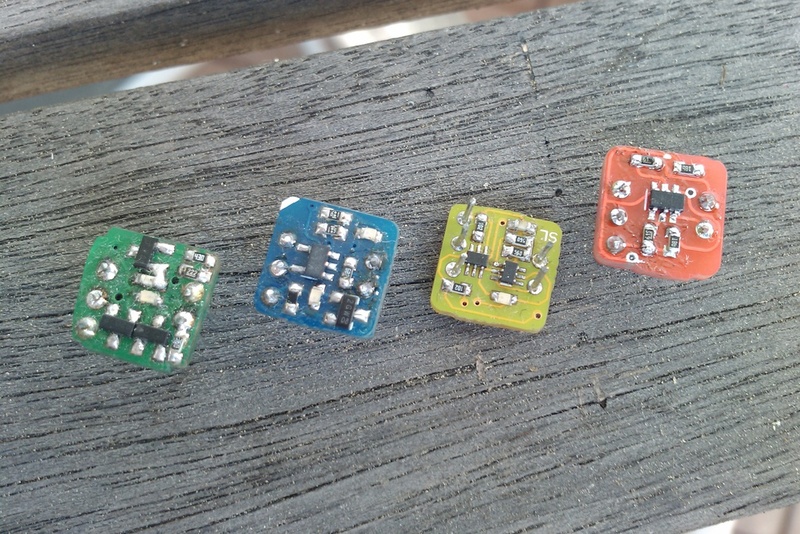 I haven't found an emoticon for "soldering SMT makes me crazy and blind."